The healthy new you eats every 2-3 hours, small meals full of good whole foods. 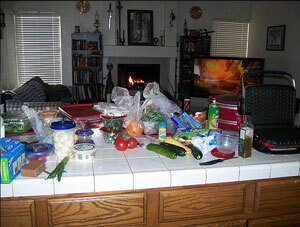 Your food preparation is simple, and completed in a few hours, one day a week. You carry a cooler full of your healthy snacks and meals so that there is NO excuse to hit the drive thru or raid the candy box or vending machine. Let's break it down. Once a week, you will do your grocery shopping. That same day, you can do all your food preparation so that during the week, all you have to do is reach into the refrigerator and grab a few things to toss in your cooler. It really is that easy! Grocery List: As always, read the labels carefully. You'd be surprised where the food industry sneaks in extra fat, sugar and sodium! This list isn't meant as a "Buy everything on here" list... it's just a guide. available in the meat department of most grocery stores, but those packs are higher in sodium. I purchase my ground bison and bison steaks over the meat counter at my local Whole Foods, and it has zero added sodium or hormones, etc. Bison is an excellent source of CLA. Eggs - for our family of 6 I buy 2 18packs of eggs. I hard-boil one 18 pack, and use the others throughout the week. The kids LOVE to scramble up a bunch as snacks. Lunch Meat - Yes! You can enjoy deli meat! Visit my deli-meat page to learn more. Sucanat or Rapidura or Demerara or Sugar in the Raw, or Evaporated Cane Juice - These are all non- or less- processed sugars unlike refined white sugar which has had all nutritional value stripped. There are tons of choices for healthy flours, just experiment until you find what you like best. The weekly shopping list for my family varies due to what's in season (buying only fruits & veggies in season will save you money! ), which meat-proteins are on sale, and so on. If Pork is on sale, guess what we're eating that week! :-) I often make 2 or 3 proteins... chicken breasts (always) and pork or beef or bison or whatever else. Chicken is a staple because I can do so much with it and it works really well for pretty much any dinner I have planned for the family. I also almost always brown up a few pounds of ground meat, then it's ready for chili, spaghetti, tacos, pizzas, whatever. Plus, if you make too much, you can easily freeze what's left. Also, a lot of items aren't on the "weekly" list... like nut butters, seasonings, etc, since we don't go through them that fast. Once your pantry is stocked with that kind of thing, you'll notice your grocery bill go down. Especially if you buy your produce in-season! NOTE: How long does chicken last in the fridge? I get asked this a lot. I make ALL my chicken on Sunday... it lasts ALL week long. I've never had it go bad, or even questionable. I keep my fridge extra cold, so that might help. But here's the deal... if it makes you nervous, then make ALL the chicken and FREEZE half of it. On Wednesday, pull the frozen cooked chicken out and let it defrost in the fridge for the rest of the week. Easy. Problem solved :-) Same deal with chili, or any other meat you cook on Sunday. On any given Sunday, I have meat marinating to be grilled, 2 or 3 crock pots going, flax seed grinding, and veggies being chopped. In my house, Sunday is home to the counter of chaos™. :-) Fortunately, my kitchen is in a great location so I don't feel like I'm "apart" from the family while I'm getting things ready for the week. Usually, my husband is watching sports or something on the TV, the kids are running back and forth (as is the dog), and I have my iPod boombox going while I prep the food. It doesn't feel like a task, or a job to be done. It's fun, and I enjoy it very much. It's chaos, but I love it. And when it's all done and the counter is wiped down... I feel like I've really accomplished something! The key to the Single Day Food Prep is to plan your week's food. From Breakfast to snack to lunch to snack to dinner to anything else. Make your menu. Then make your grocery list. Then start prepping. Cook on high 4 hours, then 2-4 more hours on low. 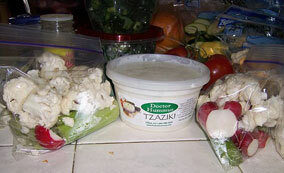 Transfer chicken breasts and "juice" to a heavy duty plastic container (see products below). Allow to cool slightly before placing in refrigerator. I then shred some chicken and place in a plastic container. I cut a couple chicken breasts in half and put each half in a separate Ziploc sandwich bag. The rest of the chicken breasts, I leave in the broth in the container to be used as needed throughout the week. Options for roasted protein include (but are not limited to) chicken breasts, turkey breast, Lean Pork Tenderloins. Carefully read labels and look for meat products that are low sodium, no preservatives or artificial colors or ingredients, and preferably grass fed & hormone free. Bake / Roast according to directions. Cool slightly, then slice. Place the equivalent of one serving in each Ziploc sandwich bag. Toss in Fridge. --Note: 1 serving of protein is approximately the size of the palm of your hand, the width of a deck of cards. Or use a cheapy food scale and shoot for 4-6 ounces. Marinate your meat. When ready, grill to preferred doneness. Allow to rest 10 minutes, then slice. Place sliced meat, portion size, in ziploc bags for wraps, sandwiches, salads, or whatever. Meats I grill are (but not all in the same week) Buffalo, beef, chicken and pork. 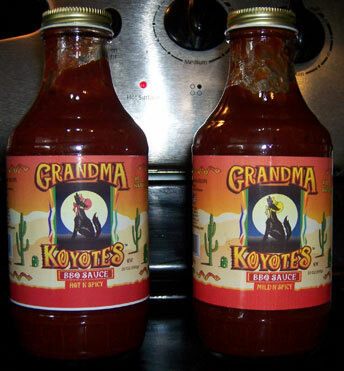 The marinades I use are: Grandma Koyote's BBQ Sauce, Mrs Dash Spicy Teriyaki 10min marinade (no sodium! ), and Bronco Bob's Roasted Raspberry Chipotle sauce (which is the kids' favorite), and Robbie's Barbecue Sauce. These are the amounts I use each week (remember, I've got a family of 6). My veggie choices are directed by season... and what's on sale. I don't necessarily make everything listed below. Choose the veggies you want, and go for it! 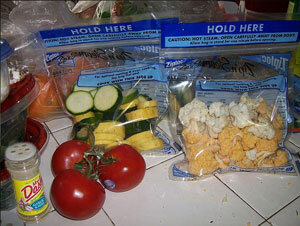 Add a mix of veggies (or single veggies) to each steamer bag (about 1 to 1 1/2 cup in each bag). Sprinkle in some Mrs. Dash. Seal. Toss in Fridge. You can also add a bit of olive or coconut oil to the bag if you want to put in some healthy fat. A sample week for me includes 3-4 crowns of broccoli, 1 head of cauliflower, 2 zucchini, 2 squash, 1 pkg of snow peas, 1 container of cherry tomatoes, 1 lb green beans. This makes all my packets, plus a few for family dinners. If I'm planning pizza for a family meal, I'll go ahead and chop up the veggies I'll need then toss them in baggies. Additionally, the kids like to snack on sliced veggies, so I'll chop those up, too. Put a handful of veggies into Ziploc sandwich bags. Toss in Fridge. Boil a dozen eggs (or more depending on the size of your family). Cool. Shell and rinse. 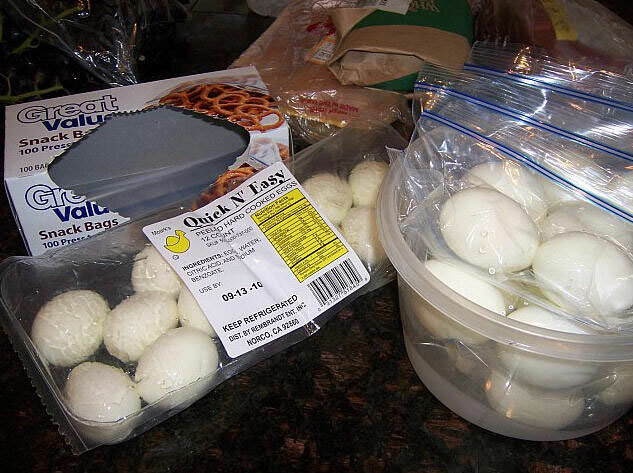 Place 2 hard boiled eggs in each Ziploc sandwich bag. Toss in Fridge. These will keep well all week. No worries. **TIP: Use eggs that are a minimum of 1 week old. Allow to reach room temp before boiling. After boiling, rinse in cold water, drain most of the water out, put the lid on and shake the pot. This causes the eggs to crush their shells. Make sure all eggs are "cracked", then add cold water to cover and allow to sit for about 15 minutes. When ready to peel, they should go really easily. ***TIP 2: Many stores now carry pre-shelled hard-boiled eggs. This is a great resource for weeks when you just run out of time. With a coffee grinder, grind about 1/4 cup whole flax seeds (unless using pre-ground seed). Separate into several small plastic containers (about 2 tblsp each). 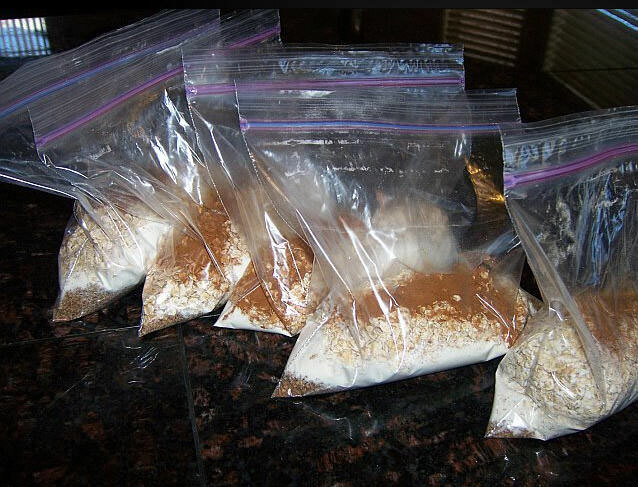 Add 1 scoop Vanilla Protein powder into each container. Add about 1/2 to 1tsp of ground cinnamon to each container. Cover/Seal. To prepare: Empty contents of one plain oatmeal packet into bowl. 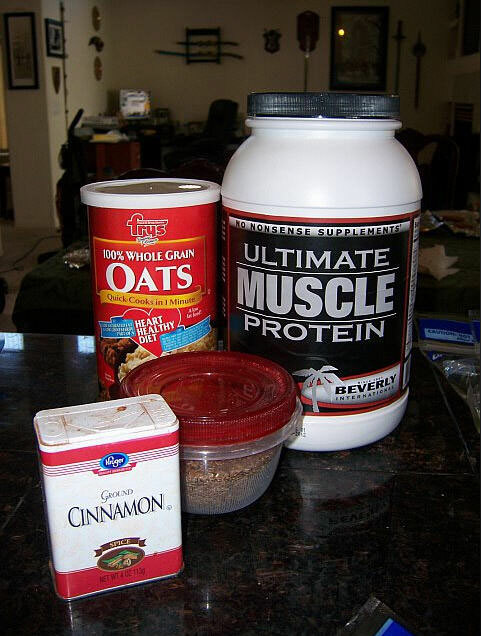 Mix in the protein/flax/cinnamon. Add water. Stir. Microwave for 1 minute. Stir well. Add 1/2 cup fresh berries if you like. Enjoy! 1. 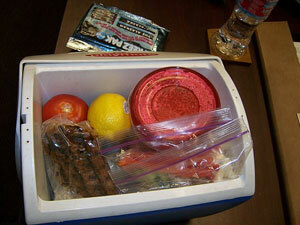 Pack Cooler... Plan to eat every 2 to 3 hours. Remember, for every snack/meal you need: protein, carbohydrate and fat. See the sample below. And don't forget to drink LOTS of water! Meal One: 1 cup Plain Greek Yogurt (chobani) with 1/2 cup fresh berries & 2 tbsp ground flax seed. Meal Two: 1 2oz water packed tuna (StarKist Albacore White Tuna) with 2 Ryvita rye & oat bran crackers, 1 string cheese and a few strawberries or carrots. Meal Four: Baggie of chopped veggie sticks and 2 tbls. low fat cream cheese, and 1/2 chicken breast. The last two meals are at home. dinner: Spaghetti Squash w/chicken & olive oil (see recipes) and a green salad with lemon juice. last snack: Siggi's yogurt or a handful of carrots (if hungry). Meal One: Packet oatmeal, protein/flax/cinnamon in container w/ 1/2 cup fresh berries/fruit. Meal Three: Baggie of Pork Tenderloin (or Turkey Breast), Steamer bag of veggies, and 1/2 cup serving of brown rice. Meal Four: Steamed veggies w/ 1/2 tsp coconut oil, 2-3 ounces of chicken breast. last snack: natural almonds and an apple (if hungry). Meal Three: 4 oz of Pork Tenderloin (or chicken breast), Kale salad w/mixed veggies and garlic-olive oil drizzle, and 1/2 cup serving of brown rice. dinner: Grilled steak salad w/ olive oil & balsamic (if dinner isn't too late, I'll toss in 1/2cup of brown rice to the salad).